The Lingua File from TLF Translation: Who's In Charge of a Language? Who's In Charge of a Language? The recent story of Wikipedia editor Bryan Henderson who corrected 47,000 instances of a grammatical error got our attention this week. While it's great that there are people out there willing to improve Wikipedia in their free time, deciding what constitutes a grammatical error, especially in English, is sometimes hard to do. Henderson corrected instances of the phrase "comprised of", instead preferring "consist of", "comprise", or a rewording of the sentence. If you take a prescriptive approach to the English language, you will certainly agree that "comprised of" is incorrect and should have been changed. If you take a more liberal stance on language usage, you will probably accept that languages evolve over time and certain "errors" become so commonplace that they then become the norm. Who has the final say in what is correct and what isn't? 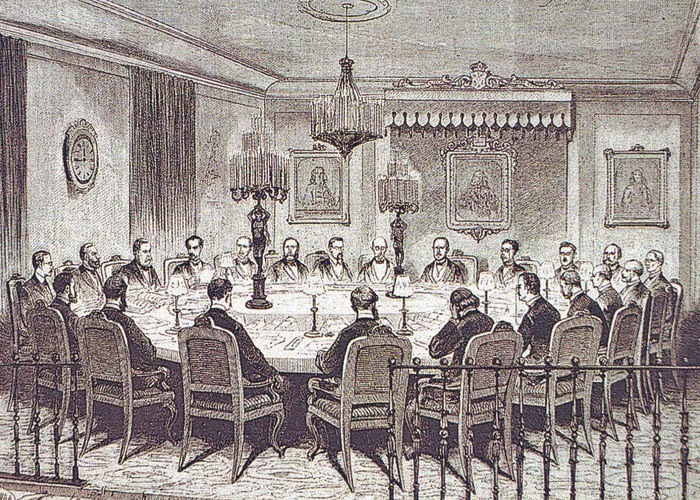 The Real Academia Española in 1872. Many languages have a regulatory body that standardises aspects of the language, whether the users of that language agree with them or not. Spanish answers to the Real Academia Española (RAE) in Spain. Along with 21 other Spanish language academies, the RAE is a member of the Asociación de Academias de la Lengua Española (ASALE), a regulatory body that supposedly governs the usage and conventions of the Spanish language as a whole. The Central Hindi Directorate, केन्द्रीय हिन्दी निदेशालय, or Kendriya Hindi Nideshalaya, primarily deals with the use of Devanagari script and the spelling of Hindi words in India. Arabic, whether you consider it to be a language, a macrolanguage, or a dialect continuum, also has a multitude of organisations that consider themselves to be the authority on its correct usage. The majority refer to themselves as the Academy of the Arabic Language or مجمع اللغة العربية. Users of the French language can refer to the Académie française in France and the Office québécois de la langue française in Quebec, Canada. Meanwhile, the Academia das Ciências de Lisboa, Classe de Letras in Portugal or the Academia Brasileira de Letras in Brazil should have answers to most of your questions about Portuguese. These few examples are just a small selection of the many regulatory bodies that consider themselves to be the highest authorities on their particular language or regional variety. The odd thing is that whether or not they prescribe certain rules or attempt to coin and standardise certain terms (take the seldom-used mot-dièse in French, for example), languages seem to evolve and change regardless of what they do. The English language has no such regulatory bodies other than grammar sticklers and those who go out of their way to correct you mid-sentence. There isn't really anybody to give a final decision on whether Bryan Henderson's actions were valid or not. You could argue that if all those Wikipedia articles were understood despite the use of "comprised of", does it really matter that much? Couldn't we just accept that it is now an accepted way to write and speak? Is Bryan Henderson a modern-day knight, protecting the sacred grammatical structure? Or is he just a pedant with far too much time on his hands? Can a single entity really control a language? Tell us what you think the comments below.